I've been a Jennifer Alice Acker fan for years! She's currently starring in "Freaky Friday" at Horizon Theatre, the sixth show I've seen her in over the last few years. You can imagine how excited I was when she granted me an interview over lunch at 5Church Atlanta. Let's get right to that interview and then I'll share a little bit about "Freaky Friday", Horizon's newest must-see show! wanderlust ATLANTA: Who is Jennifer Alice Acker? Jennifer: I'm a person—I'm more than my career—a person who loves family life, being outdoors, art and music. I love being an actor, director, and theatrical educator.I love beauty. I'm originally from Connecticut, went to Florida State, and moved to Atlanta in 2011.
wanderlust ATLANTA: Why acting? Why musicals? What was the catalyst that launched your acting career? Jennifer: I started singing in high school, doing two shows per year, and I love music, but even more I love storytelling.I enjoy the expression of emotion, the transfer of emotion, helping someone through changing something in their lives encouraged by a character I've played on stage. That's amazing. 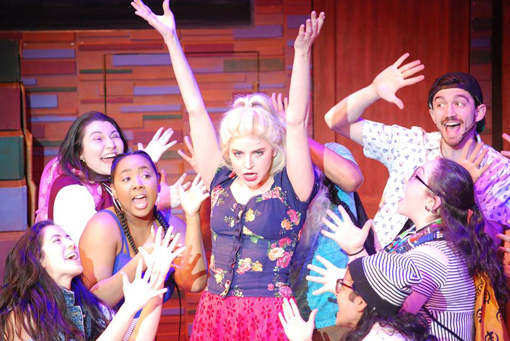 Musicals are fun, rewarding, and I find myself firing on all cylinders when singing on stage. I love the emotional honesty, the singing, and sharing a 'frequency' with other beings. At first, acting felt like a scary career choice. I felt vulnerable, like my whole person was on display to be judged. But people kept telling me, "You're really good!" wanderlust ATLANTA: Tell us about your acting career, please. Jennifer: Katherine in "Freaky Friday", of course! Also, Maureen in "Rent". At first I felt reckless, but then there was a point in the production when everything gelled. It was one of those "F*ck it. Let's do this!" moments. I found my stride and it was so awesome! Jennifer: I think it's always confidence vs. ego. Too many egos = War of the Worlds! I think the truly great actors must be confident, yet not egotistical. They have to have lots of discipline, kindness, forgiveness, and trust. Jennifer: The aftermath of landing the role of Juliette. People were coming at me asking about the iconic Juliette, offering opinions of what she should be. I didn't do that. I wasn't completely happy with the first few nights, but by the end of the run, I felt that it was one of my greatest performances. Jennifer: I don't yet know when or where, but I want to play Hamlet! I'm not sure if I want to play him as a man or a woman, yet, either. As one of the most 'damaged' characters ever, it would be incredibly fascinating to portray Hamlet on stage. Other roles I'd like to play include Evita, Medea, and a couple of 'honorable mentions' would include the roles of Audrey in "Little Shop of Horrors" and Lady Macbeth. 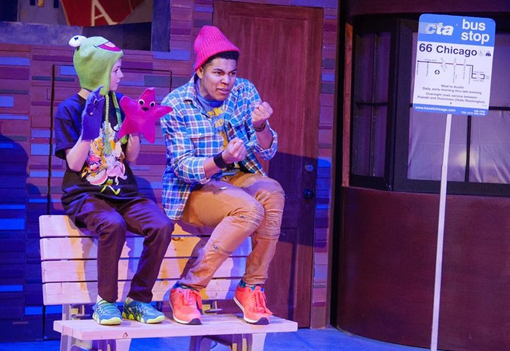 wanderlust ATLANTA: "Freaky Friday" is the largest cast Horizon Theatre has ever had on its stage. What's that been like? Jennifer: It's been crazy! There are 19 of us! It's also the biggest cast I've worked with in Atlanta. We've expanded the dressing rooms to the basement and we've started calling back stage the "submarine". There's no room for error; precision is a must! One of the interesting things is that because it's a larger cast we've not had the opportunity to get to know each other as well as we would have by now if we were a smaller cast. I'm trying to connect with everyone, but while the space restriction has made it a more intimate experience, it's difficult to really get to know everyone as much as I would like. Still, we're having a great time! 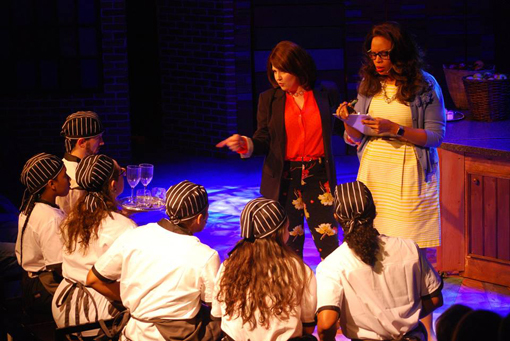 wanderlust ATLANTA: In "Freaky Friday" you play the mother of a teenage high school student. Who are you channeling? Jennifer: My own mother. And I've been playing roles as a mother since I was 15. To portray the the mother-daughter, daughter-mother relationships, I pulled from my own relationships with my mother and grandmother. Playing the daughter, well, I'd "observed" what a bratty kid was like when I was growing up, so that part was pretty easy. wanderlust ATLANTA: What's your favorite scene in "Freaky Friday" and why? Jennifer: The scene right after we switch bodies when we have to very quickly switch gears, right in front of the audience! Abby and I worked on our characters' charcteristics, explored tactics, planning next scenes...and it's been a lot of fun to perform with such responsive audiences. wanderlust ATLANTA: What advice would you give an aspiring actor/actress? Jennifer: Commit! Trust what you're doing. An audience can tell if you're not comfortable, so you have to be committed. If acting isn't for you, you can change your mind, just not in the middle of a performance. Again, commit, commit, commit. wanderlust ATLANTA: What do you do for fun? To relax? Jennifer: I like to eat, drink cocktails, and watch a good show with my fiancé. When we have time, we'll spend an evening watching a movie or catching up on a series, with a cocktail, and enjoy some lively discussion afterward. I also love fashion and although I don't go shopping often, when I do I go hard! I love being near the water...Sweetwater Creek State Park locally and the beach when I can get away. And I enjoy hanging out with friends! wanderlust ATLANTA: What's next for you? Jennifer: Professionally, I feel called to be a director. Personally, the next stage is "home". I'm in the middle of some personal growth, working on getting fully grounded. Some of the words that could describe my current path include simplicity, joy, intentionality, mindfulness...I'm working hard to be an agent for my own life. wanderlust ATLANTA: What questions has a journalist never asked you that you wished they had? Jennifer: "What scene actors have changed you?" There are those brilliant moments in acting when a fellow actor changes you. It's a wonderful surprise when it happens. Working with Ben Thorpe, he challenged me to be the most honest version of myself. Working with Jonathan Horne, he challenged me to be the most compassionate, kind person I can be. When these moments happen, they're profound and cherished. When an overworked mother and her teenage daughter magically swap bodies, they have just one day to put things right again before mom’s big wedding. 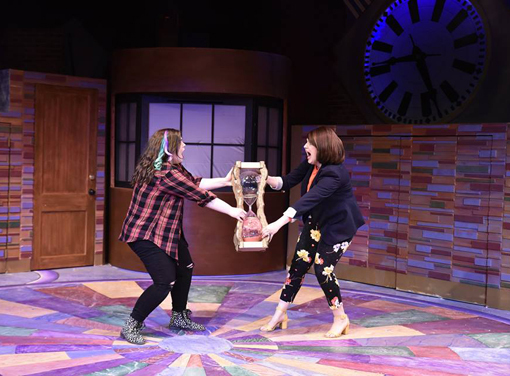 Freaky Friday, a new musical based on the celebrated novel by Mary Rodgers and the two hit Disney movies, is a hilarious and heartfelt update of an American classic in which a mother and daughter really see what it takes to be a family when they experience each other’s lives first-hand for just one "Freaky Friday". I've already seen "Freaky Friday" twice, plus the Sneak Peek—when you get to see a few numbers and meet cast and crew. And I'm certain I'll go again...it's truly that fantastic! Get ready to massage your face cheeks after the show. You're gong to laugh, laugh some more, and laugh again. There may be a tear or two, but you'll find yourself mostly surrendering to the fast-paced hilarity breezing by before you. It's true, when sitting in the front row for one of the performances, I caught a breeze coming from all the activity on stage! Jennifer Alice Acker (Katherine) is phenomenal, doesn't miss a beat! From overprotective mom to rebellious teenager to compassionate mother, Jennifer convinces audiences that she's all of that and more. And that lovely voice! Abby Holland's voice is simultaneously powerful and elegant. She's vibrant, vivacious, and victorious as a singer and actress. You can't help but love her character. Christian Magby (Adam) is as energetic and brilliant as ever. Keep your eyes on his career. He's already done so much, but it's only his beginning. Randi Garza (Savannah, Alexandra) is 'Mean Girls' come to life, totally convincing as a stuck up, snotty popular high schooler, yet a total delight in real life. Jeff McKerley (multiple characters, the cop being a favorite) is as amazing as ever, true to what his Atlanta fans have come to love. Jill Hames (multiple characters) is amazing also, working in perfect harmony with counterpart Jeff's characters, yet standing out on her own. 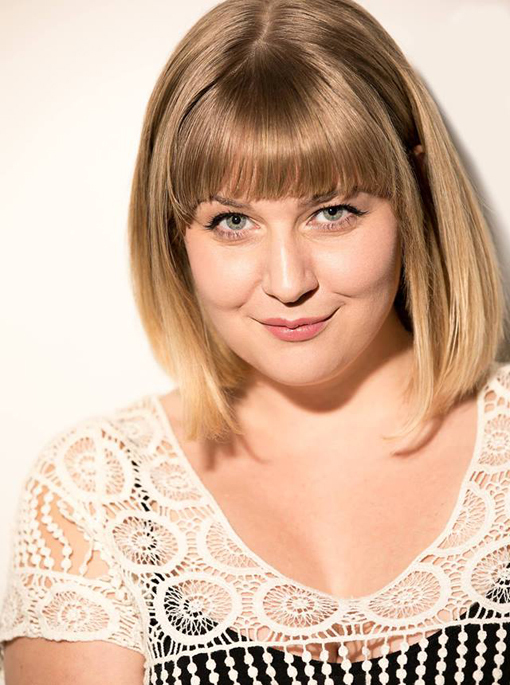 Brittani Minnieweather (Torrey, Ms. Meyers) will have you in stitches! Whether sweating on the gym floor or frantically planning a wedding, Brittani is brilliant! Joseph Masson (Fletcher) I'd seen in "Sweeney Todd" and he's even more wonderful in this play. He's 1,000% into his role and his acting is meticulous. And you can totally tell that he's having a blast! A number of Horizon Theatre's Apprentice Company members are in this performance and they're fantastic! I've not met all of them, but I have had the pleasure of getting to know a number of them, each a distinct actor/playwright/director, yet they're symphonic on stage.A few personal favorites are Shaun MacLean, Alexis Young, Maariyah Espinoza, and Sloka Krishnan. I hope to get to know the others while they're still here. So, I hope you enjoyed the interview with Jennifer. She and I were always cordial at the theatre, but now she feels like a friend. She's one of those people who is warm, inviting, and one that makes an effort to make a connection. We talked about life, we talked about philosophy, and we regaled our mutual love of theatre. If you ever befriend each other, you're in for a magical, uplifting experience. 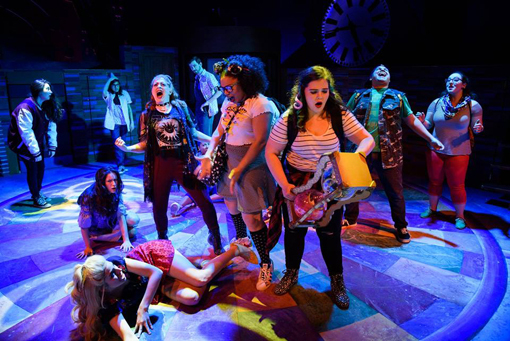 Now, get yourself to Horizon Theatre...there are only three more weeks to see "Freaky Friday". It's perfect for a group of friends, a mommy-and-me night, girls night out, a first date...pretty much anyone who likes to laugh will love this show! #htcLetsGetFreaky!!! NOTE: I was voted to Horizon Theatre's Board of Directors last fall, however I've been a fan of and dedicated patron of this theatre for many years. My opinions on this blog are absolutely my own.